Jules Girardet (1856–1938), Rout at Cholet, October 1793 (1886), media and dimensions not known, Musée d'art et d'histoire de Cholet, Cholet, France. Wikimedia Commons. 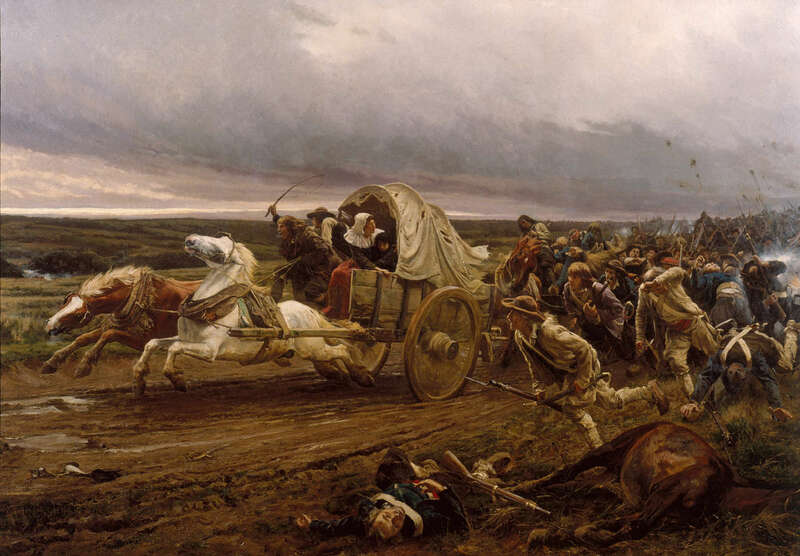 In the previous article, I showed some of the paintings which had been made of the horrific civil wars in the west of France, up to 1880, when they suddenly became both frequent and very popular. 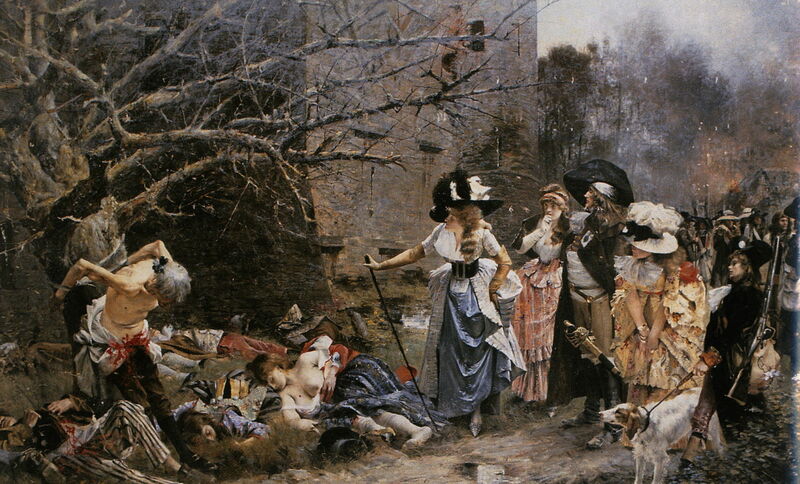 Évariste Carpentier (1845–1922), The Flight of Royalists (1878), oil on canvas, 104 x 153 cm, location not known. Wikimedia Commons. Their greatest exponent was the Belgian artist Évariste Carpentier, who had trained in Antwerp before going to the south of France in 1879 to recover from an old knee injury which threatened the amputation of his leg. Although he didn’t arrive in Paris until the following year, 1880, in 1878 he painted The Flight of Royalists. 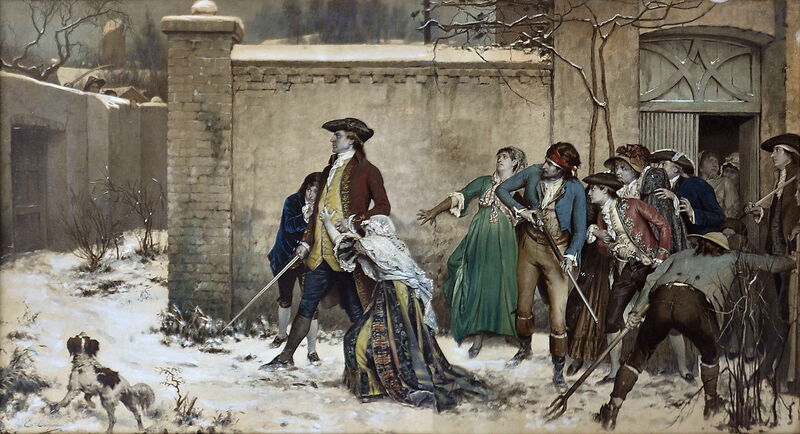 This overtly anti-Republican work shows a Royalist family fleeing during the massacres in the Vendée. Évariste Carpentier (1845–1922), Refugees (c 1881), chromolithography of original painting, media and dimensions not known, Private collection. Wikimedia Commons. In about 1881, with this theme gaining popularity, Carpentier painted Refugees, which recasts that earlier work into an urban scene and augments the numbers. If there’s any doubt left in the viewer’s mind, at the lower left is a Cavalier King Charles Spaniel. This painting proved so popular that it was reproduced as a chromolithograph, which is what I show here, as I have been unable to trace a suitable image of the original painting. Évariste Carpentier (1845–1922), Routed Chouans (1883), oil on canvas, 90 × 60 cm, Musée d’art et d’histoire de Cholet, Cholet, France. Image by Debibemus, via Wikimedia Commons. 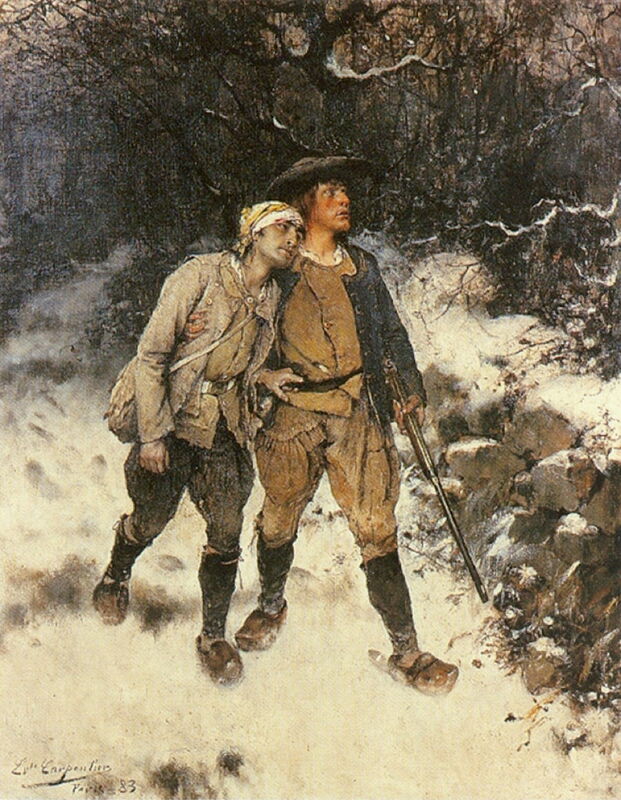 In 1883, Carpentier added this painting showing a couple of ill-equipped Royalists in retreat during the winter to the north of the River Loire: Routed Chouans. 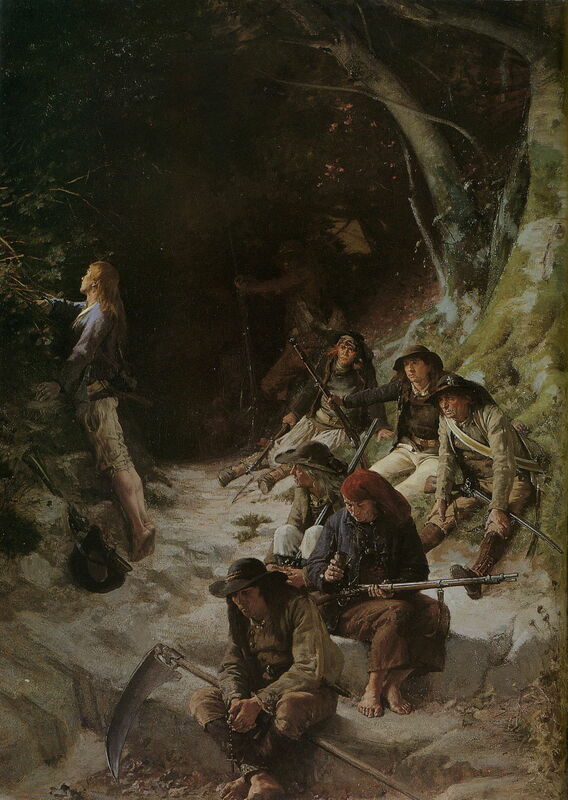 Évariste Carpentier (1845–1922), Chouans in Ambush (Battle of La Gravelle, 1793) (c 1883), oil on canvas, dimensions not known, Musée d’art et d’histoire de Cholet, Cholet, France. Wikimedia Commons. 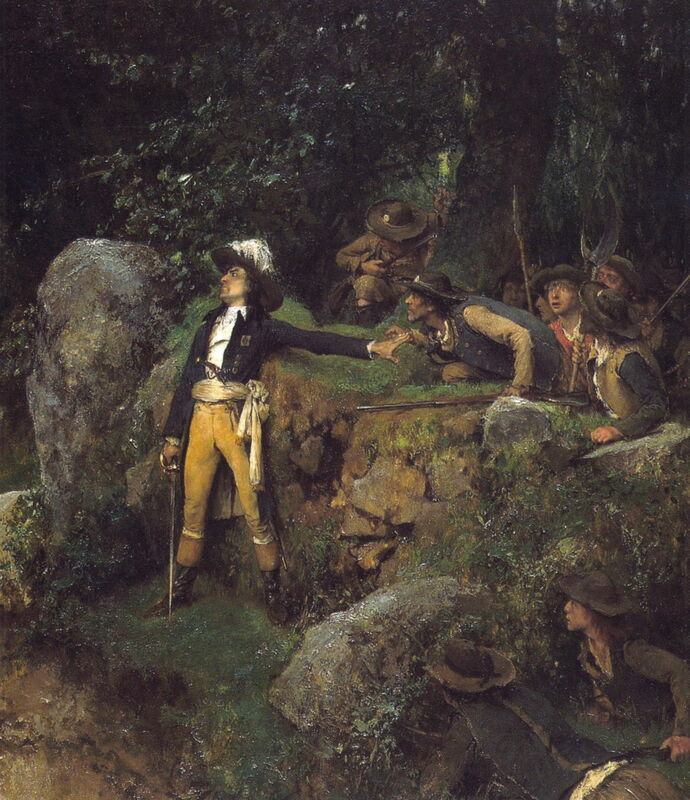 He celebrated the guerilla tactics of the Royalists in Chouans in Ambush (c 1883), which shows a scene from a small battle near La Gravelle, more probably in 1794. Évariste Carpentier (1845–1922), The Alert (1884), oil on canvas, 122 × 174 cm, Broelmuseum Kortrijk, Kortrijk, Belgium. Wikimedia Commons. 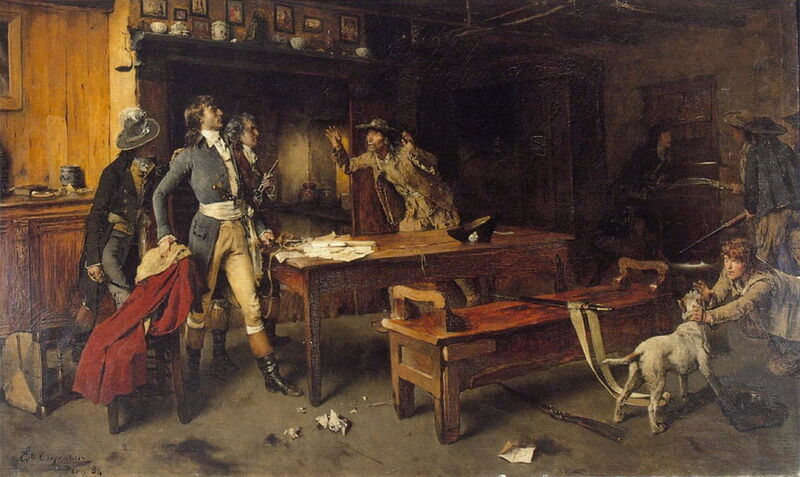 The last of Carpentier’s pro-Royalist paintings which I show here is a tense indoor scene of The Alert, which he completed in 1884. That was the year that he ‘discovered’ the paintings of Jules Bastien-Lepage and started making landscapes en plein air. He abandoned history painting, and returned to Belgium in 1886. Charles-Alexandre Coëssin de la Fosse (1829–1910), Episode of Chouannerie (1883), media and dimensions not known, Musée d’art et d’histoire de Cholet, Cholet, France. Wikimedia Commons. In the early 1880s, the anti-Republican artist Charles-Alexandre Coëssin de la Fosse painted several scenes from the civil war north of the River Loire, among which is this Episode of Chouannerie from 1883. Clues that these are Royalists are plentiful: the rosary and crucifix in the hands of the man in the foreground, their improvised arms, dress, and the fact that three are barefoot. François Flameng (1856–1923), Massacre of Machecoul, 10 March 1793 (1884), oil on canvas, 500 x 640 cm, Musée d’art et d’histoire de Cholet, Cholet, France. Wikimedia Commons. François Flameng’s account of the Massacre of Machecoul from 1884 is harder to read. The victims at the left include civilians, and are some of the nearly five hundred inhabitants of this small village in the Vendée, who were massacred on 10 March 1793 by Royalist forces. Those at the right who have come to promenade past the corpses would logically also be Royalists, making this a pro-Republican statement to counterbalance claims that it was the Republicans who had killed many civilians. Flameng’s huge painting had been commissioned by the state, and was exhibited amid great debate at the Salon in 1884, following which it was deemed too grisly for a major collection, and was despatched to the city of Agen in the south-west of France. Georges Clairin, a friend of Flameng and with a similar place in society, was a little more subtle perhaps in The Living Defend Their Dead. 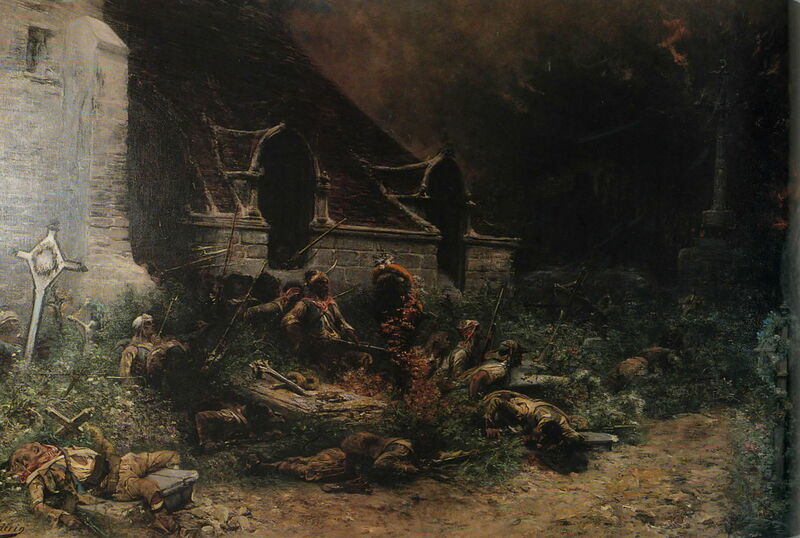 War in the Vendée (undated), where a small group of ramshackle Royalists is taking shelter in the graveyard of a country church, on the lookout for the enemy. 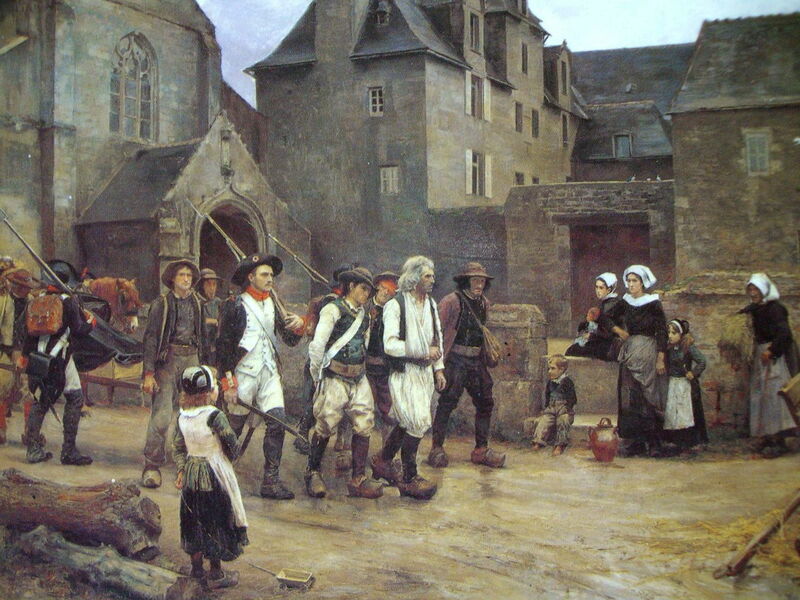 Jules Girardet (1856–1938), Mutineers of Fouesnant Arrested by the National Guard of Quimper in 1792 (c 1886), oil on canvas, dimensions not known, Musée des Beaux-Arts de Quimper, Quimper, France. Wikimedia Commons. Jules Girardet had established himself a reputation with paintings of the 1871 Paris Commune, and one of its heroines, Louise Michel. In about 1886, he painted at least two works showing anti-Republican action. Mutineers of Fouesnant Arrested by the National Guard of Quimper in 1792 shows a small group of men, wearing large wooden clogs, being marched in after leading a local insurrection. Jules Girardet (1856–1938), Rout at Cholet, October 1793 (1886), media and dimensions not known, Musée d’art et d’histoire de Cholet, Cholet, France. Wikimedia Commons. Girardet’s brilliant painting of Rout at Cholet, October 1793 also from 1886 shows the tragic end to the war in the Vendée, when Republican forces inflicted their first serious defeat at the town in the centre of the region on 17 October 1793. Given the slaughter of Catholics and Royalists which had already started, they were really fleeing for their lives. 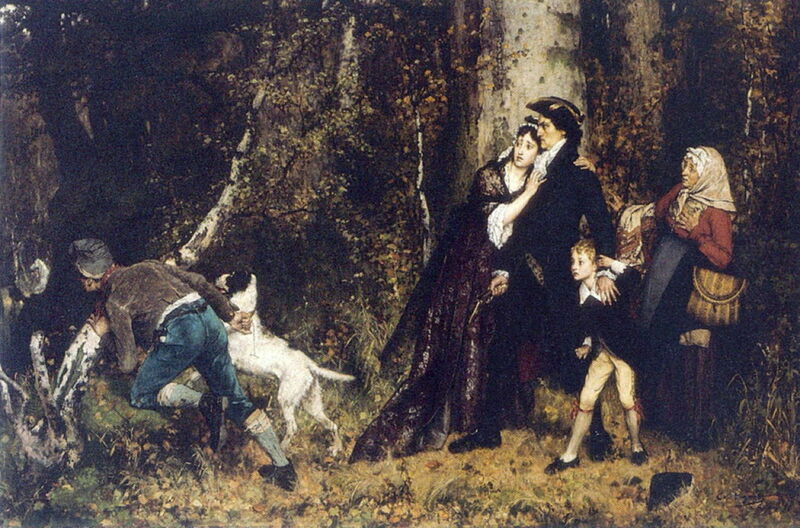 Alexandre Bloch (1857–1919), Death of General Beaupuy at Château-Gontier, October 1793 (1888), oil on canvas, dimensions not known, Musée de Beaux-Arts de Rennes, Rennes, France. Wikimedia Commons. From the defeat at Cholet, remaining Royalist forces converged on Granville. On their way, they encountered Republican troops at Château-Gontier. 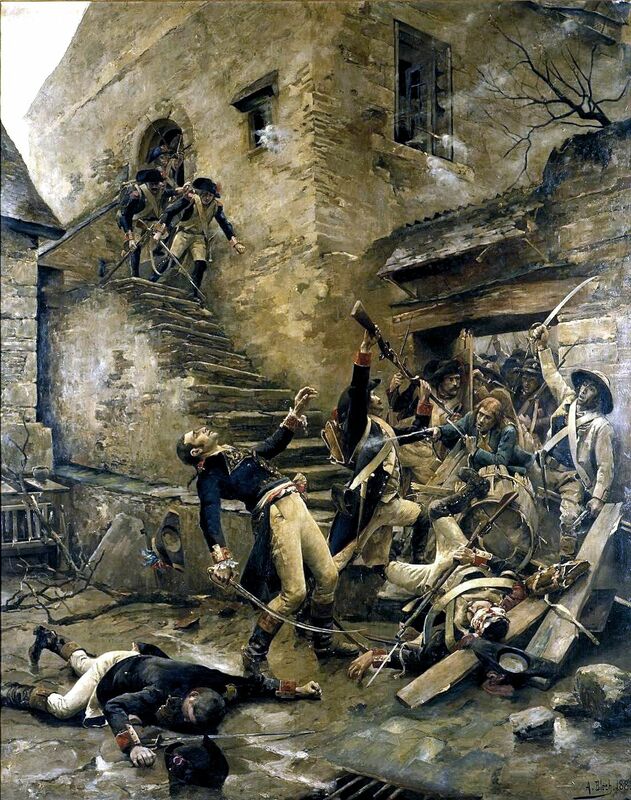 In the course of brief action there, the Republican leader was killed, as shown in Alexandre Bloch’s painting of the Death of General Beaupuy at Château-Gontier, October 1793 from 1888. The troops in uniform on the left are Republicans, with the dying General in the lower centre, and Royalists to the right. The Royalists found Granville heavily defended, and failed to capture the town. They were finally defeated at the Battle of Savenay on 23 December, leaving General Turreau to kill a further twenty to fifty thousand civilians in his scorched earth policy in the first half of 1794. Pierre Outin (1840-1899), Episode in the Defeat at Quiberon (1899), media and dimensions not known, musée d’Art et d’Archéologie de Moulins, Moulins, France. Wikimedia Commons. The last painting showing this civil war was also one of the last painted by the French history painter Pierre Outin, of an Episode in the Defeat at Quiberon (1899). 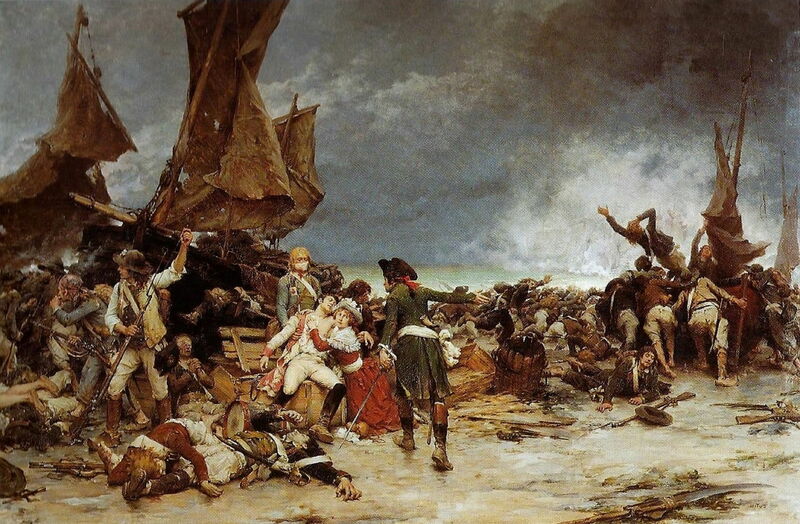 This returns to the curious British-supported invasion of Quiberon Bay in July 1795, with Royalists trying to keep Republican forces at bay while their civilians are taken out to vessels of the Royal Navy to be rescued. During the 1880s, history paintings showing scenes in the Vendée and to the north of the Loire were shown at a rate of about three or four a year in the Salon in Paris, and a total of nine were included in the Exposition Universelle in 1889. The critics began to weary of them, and asked that they cease. By the dawn of the twentieth century, they had all but vanished. Posted in Life, Painting and tagged Bloch, Carpentier, Clairin, de la Fosse, Flameng, French Revolution, Girardet, Outin, painting. Bookmark the permalink.